Truly, the Lord has been merciful to our little family. And I can't help but quickly share what has taken place lately so that we always remember how merciful He is. This pregnancy, my platelet levels have been on a roller coaster ride. Platelets are what causes the blood to clot, and when there aren't sufficient platelets, it can cause major concern for delivery. Normal range is 150-400, and safe low range during pregnancy is 80-90. At week 36, we learned that my platelets were the lowest they've ever been. At 77. I didn't realize the severity of this condition until the midwife started talking to me about what this could mean. Blood transfusion. Or induction to ensure that all the proper doctors and procedures are in place in case something serious happens. Etc. Etc. Etc. And not to mention that epidurals are not an option below 80. Sadly, that thought was the least of my concerns. I was a wreck all that week. Worst-case scenario thoughts keep coming into my mind. And they scared me. I wasn't ready to to leave my little family. I didn't even want to let those thoughts creep in, (and I'm sure that the pregnancy hormones were making me far more emotional) but those were my honest feelings. My perspective changed that week. This condition, known as Thrombocytopenia, taught me to slow down, to love more. To appreciate every single minute of every single day. To get down on the floor and pass the ball back and forth to Blake. To drive cars all over the coffee table with him and hear squeals with delight. To make dinner for my husband. To serve more. I got a Priesthood blessing from Brandon and my dad. And it helped calm me and give me more peace about the situation. The next week, we got terrific news! They had jumped back up to 95. We were ecstatic! And then at 38 weeks, the dropped to 69. Ugh. Pit in the stomach. I cried. I started to worry again. This trial was not over. My emotions continued to be as high and low as my platelets were. I got a call first thing the next Monday morning from the midwives. They consulted with some high-risk doctors about the plan and called to let me know. So for the past week, I've been taking Prednisone, in high hopes of it increasing my platelet levels to a point where they are safe enough to induce labor and get the baby out before my platelets drop again. The entire last week, we've been praying and hoping that the medicine would work. I lost it again on Saturday night, but without sharing too many personal details, our family of 3 shared one of the most sacred, spiritual moments we've ever had together. Right in our little, cozy, apartment. If there was one reason for the house not working out back in July, it was just so we could have that defining moment together here in this home. At that point, we still did not know the outcome of everything, but I finally gained complete confidence and peace in knowing that we would be taken care of. My worry was gone. I felt like a huge emotional weight had been lifted. I gained more appreciation for the Priesthood and this amazing gospel we have. This trial tested my faith more than it ever has been in a long time. But I'm sincerely grateful for all that I learned through it. Today, we got word that my platelets jumped back up to 96. So while they are high, we are planning on having this baby tomorrow. TOMORROW! I can't believe it. Induction is never something I wanted. I think babies come best when they are ready, but after all the emotional battles we have been fighting, we have to come to peace with that this is the best option given the circumstances. Tonight we had a last "family of 3" outing. 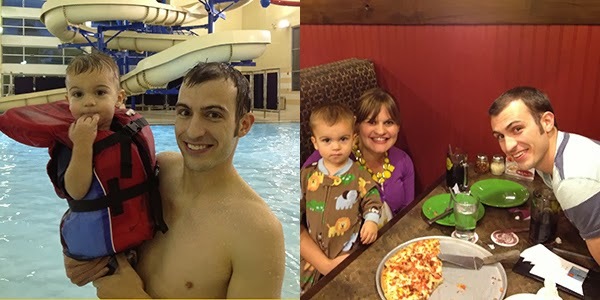 We took Blake to the pool and got pizza at the Brick Oven. He has captured our hearts, but I can't wait for tomorrow when another brand new spirit from heaven does the very same thing. Do miracles still exist? Yes, of course they do. Can't wait for your second miracle to arrive today! Love you and good luck! beautiful words that made me cry. i love you guys and can't wait to cuddle your new little one and be with blake too! Good luck! We are praying for you! Best of luck today! SO excited for you guys & I can't wait to meet that little one! I am SO excited for you guys. Can't wait to hear all about it--hoping for news of a healthy baby!! Thinking and praying all goes well today. Enjoy the miracle and what a wonderful way to remember it forever. You can do hard things! It's hard to believe that you're in process of having this baby right now! I'm so excited for you guys and know that everything will be fine! Can't wait to meet Baby Sunday 2! Seriously, I'm crying over here. Miracles are so, so real! Thank you for sharing your thoughts! We are keeping your cute family in our prayers today! :) Can't wait to hear about your new arrival! Melissa, what an amazing person you are. I just love learning from you. You are amazing. Hang in there. You'll be just fine. Right after I had Connor I had to have a blood transfusion....call me if you have any questions, it wasn't a bad experience - it was hard, but it was not bad at all! I'm so excited for you guys. You'll be in my thoughts and prayers! MK! So sorry that things were hard at the end of the pregnancy for you. It is amazing how much people go through without others knowing. Thanks for sharing your story. I'm glad you were able to have answers to prayers. And what a wonderful thing to have doctors and others watching out for you.